On first glance, The Letter to the Hebrews might seem to endorse sacrifices, but a closer reading presents what I think is a non-sacrificial message. Hebrews describes Jesus’ death as a sacrifice, but I think it is a new kind of sacrifice. The letter’s author wrote, “For it is impossible that the blood of bulls and goats should take away sins” (10:4). What will take away sins, if not animal sacrifices? I want to examine Hebrews 10:8-18 closely in an attempt to answer this question. Hebrews 10:8-10 reads, “When he said above, ‘Thou hast neither desired nor taken pleasure in sacrifices and offerings and burnt offerings and sin offerings’ (these are offered according to the law), then he added, ‘Lo, I have come to do thy will.’ He abolishes the first in order to establish the second. And by that will we have been sanctified through the offering of the body of Jesus Christ once for all” (10:8-10). The writer has argued that the unsatisfactory old sacrifices under the Law have been replaced by “the offering of the body of Jesus Christ.” The critical question that I will attempt to answer is: Who made the offering? Verse 10:11 reiterates that animal sacrifices cannot expiate sins: “And every priest stands daily at his service, offering repeatedly the same sacrifices, which can never take away sins.” Hebrews 10:12-13 reads, “But when Christ had offered for all time a single sacrifice for sins, he sat down at the right hand of God, then to wait until his enemies should be made a stool for his feet.” I think verse 10:10 describes Jesus’ sacrifice as a self-sacrifice. If we posit that he was sacrificed by humans, then we come to the awkward conclusion that an act of scapegoating and murder justifies humankind. If he were sacrificed by God, this would portray God as one who had killed not only an innocent man, but a man who was also God’s beloved son. Verse 10:13 describes Christ waiting “until his enemies should be made a stool for his feet.” Jesus said Satan’s attempt to cast out Satan divides the house and the house cannot stand (Mark 3:23-25). I think this passage reminds readers that the power of love and forgiveness is ultimately stronger than satanic powers. We do not need to fight evil; we should concentrate on doing good ourselves while we wait for the forces of evil to destroy themselves. Verse 10:14 states, “For a single offering he has perfected for all times those who are sanctified.” A Girardian understanding of this verse is that Jesus’ sacrifice was a perfect self-sacrifice, and those who believe in Christ no longer need “sacred” violence in order to feel sanctified. In contrast, animal victims of sacrifice, though initially innocent, became “guilty” by virtue of priestly rituals that transferred guilt from people to the animal. 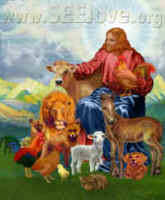 The animal victims, therefore, “deserved” their fate, and there was no scandal in sacrificial violence. Until Jesus’ sacrifice, the Hebrews, like other ancient peoples, held the conviction that they needed to sacrifice in order to expiate their guilt. Verses 15-18 clarify, “And the Holy Spirit also bears witness to us; for after saying, ‘This is the covenant that I will make with them after those days, says the Lord: I will put my laws on their hearts, and write them on their minds,’ then he adds, ‘I will remember their sins and their misdeeds no more.’ Where there is forgiveness of these, there is no longer any offering for sins.” Guided by the Holy Spirit, God’s laws will be on our hearts and minds. If we accept the love and forgiveness and that these laws embody and repent of our sinful ways, we will have no need or desire to engage in “sacred” violence. Many Christians have interpreted Hebrews 10:8-18 to mean that the old covenant has been replaced by a new covenant formed by the divinely ordained sacrifice of Jesus. However, as has been discussed previously, those who regard God as desiring sacrificial violence have been inclined to justify their own violence as sacred, righteous acts for God. An interpretation that I think respects the text and accords with an image of God being centered on love rather than wrath holds that the old sacrificial order has been abolished and replaced by a new order, in which people have been sanctified by obedience to God. According to this analysis, Jesus’ death was not a sacrifice to atone for sins but rather a sanctification of his life by virtue of his choosing to do God’s will. What was God’s will? God’s will was that Jesus would take away the sin of the world, i.e., expose universal “sacred” violence as scandalous. I will continue this discussion of The Letter to the Hebrews next week.